Remember — protected predators keep the balance! 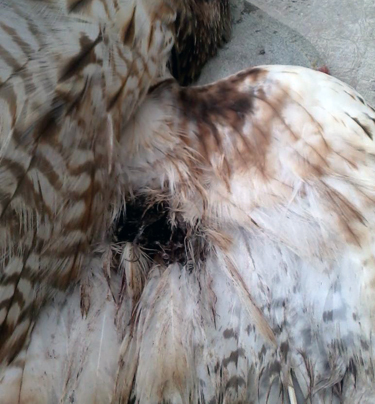 Unfortunately it’s that time of year when we can see red-tailed hawks admitted with what are likely gunshot wounds. See photo right of a bird admitted 30 October 2012 >>>. The Migratory Bird Treaty Act and state laws make it illegal to kill, capture, possess, harass, or harm any bird of prey. Violations are punishable by fines of $5,000 to $250,000 or more, jail sentences, confiscation of possessions, and revocation of licenses. Red-tailed hawks are the most regularly seen, large, sit-and-hunt, small mammal predator. They seem to be everywhere in the fall as young disperse and northern birds move in to take advantage of open hunting ground. This changes by late February. The resident nesting pairs clean house by chasing all other hawks out of their territories. Don’t get caught believing that hawks are eating all the game birds! Did you know that 75% of red-tailed hawk’s diet is made up of small mammals like rabbits, mice, rats, and ground squirrels?